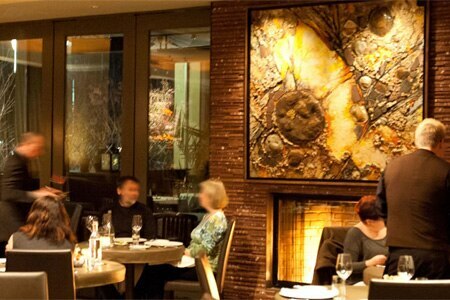 La Toque of the town, this restaurant is a key player in the city of Napa's renaissance as a food destination. Dinner nightly 5:30 p.m.-9:15 p.m.
About the restaurant and décor: The supersize white toque marquee above the entryway fairly symbolizes the restaurant's ascent. It's located in the natty The Westin Verasa Napa hotel and is a key player in the city’s renaissance as a food destination. La Toque is visionary chef Ken Frank's wish come true: state-of-the-art kitchen, spruce dining room dressed in neutrals and flowers by his wife, patio for private dining with orange banquettes, roll-back roof and a two-way fireplace bridging both spaces. About the food: A short stroll away lies an extensive chef's garden and orchard; founded by Frank in partnership with the city and shared by several local restaurants, it may yield the Early Girl tomatoes in your soup. Passion for ingredients and attention to detail are apparent from the get-go. Guests can compose a prix-fixe menu of four ($110) or five courses ($130), or opt for the chef's tasting menu ($220) or vegetable tasting menu ($110). (Wine pairings can be requested at an additional cost.) Consider the seared foie gras with crispy pork confit and pink pearl apples, or Half Moon Bay skate with tamarind, cauliflower and golden raisins. Make way for entrées such as dry-aged Liberty Duck breast braised in lapsang souchong with Chinese spices or milk-fed veal chop for two with red onion bone marrow marmalade. Finish with the decadent Gateau Concorde, a flourless chocolate cake. About the wine: The experience is further enhanced by choreographed service and sommeliers who reveal the personalities of astutely-matched wines from a distinguished cellar. The Coravin preservation system allows guests to sample premium wines like Opus One "Overture," available in a three-ounce pour.